This duel is an image that I have wanted to create for several years. 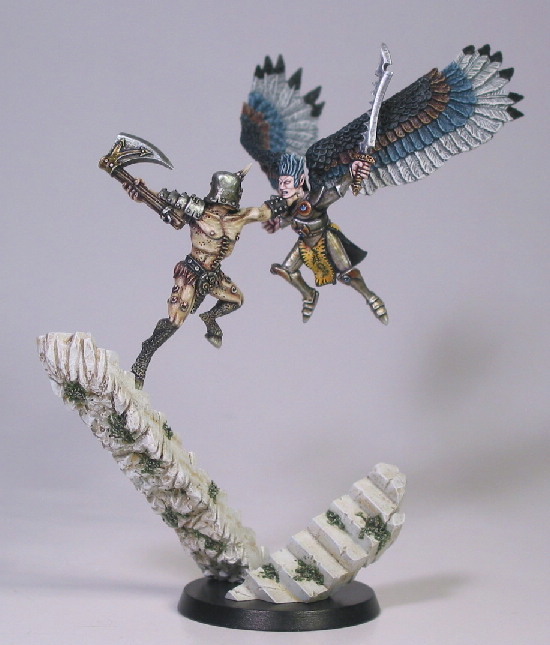 The model is inspired by a fantastic piece of artwork by Adrian Smith in the second of the two Realm of Chaos books. Of course my interpretation differs from Adrian Smith's work in many ways, but the main composition shows a great overall resemblance and thus the model shows a great inheritance from the artists of the early days of the hobby. Also, the model somehow marks a completion of modelling chaos duels by pitting the agents of Nurgle and Tzeentch against each other in a composition very similar to my Deamon Battle from GD 1999 where the combatants are a Bloodthirster and a Keeper of Secrets. Now the major powers are portrayed and I can move on to other themes for future duel entries.